The recent local elections in Romania (10 June 2012) have reflected what several political commentators and researchers have warned about: the Social Liberal Union (USL/ Uniunea Social Liberală) consisting of the PM Victor Ponta’s Romanian Social Democrats (PSD/ Partidul Social Democrat) and their allies the Center Right Alliance, which reunites the National Liberals (PNL/ Partidul Naţional Liberal) and the Conservative Party (PC/ Partidul Conservator), made significant inroads into the formerly center-right liberal democrat (PDL/ Partidul Democrat-Liberal) ‘fiefs’, thereby capitalizing on the general dissatisfaction with the PDL’s mismanagement of the past years. Without doubt, the PDL has registered a significant loss of the citizens’ support, polling only 15.10% for the presidents of the county councils; 15.44% for mayors; 15.29% for members of county councils (according to the Romanian Central Electoral Bureau (BEC), aici). The PDL was sanctioned, not necessarily for the austerity measures during the PDL-led cabinets Boc I (2008-2009), and especially Boc II (2009-2012), but mainly for its complete lack of sympathy for the hardships the average population has been going through from the beginning of the financial crisis, for its undisguised corruption, and contempt for the principles of democratic accountability. A lot of attention has been given to the apparent ‘colouring in red’ of most Romanian counties (with refrence to the USL’s electoral colours), though such a phrase is not the most accurate, as the PSD did not succeed to gain the majority of positions within the county councils, president of county council, or as city mayor. The USL has registered a very good election result indeed, 45.85% for the presidents of the county councils; 38.46% for mayors; 49.80% for members of county councils. However, as it was aptly pointed out, in the previous 2008 local elections, the constitutive parties of the said alliance have registered better results individually, totaling around 51% (the official results for 2008 available from the BEC, aici ). Many commentators have rushed to assure – even ex ante – that the results of the elections are to be seen as ‘true’ measure of the coming Parliamentary elections in November 2012. With the recent change of the electoral law, the social-liberal USL is forecast to gather some 60 to 70% of the votes. Leaving aside the frenzy of counting in advance what could happen in a few months from now (especially in the very volatile context of European politics, with – among others – a very tough negotiations with regard to the future of the common currency and the overall economic (in)stability in the EU, the second round for the French Parliamentary elections yet to take place, and the new Greek Parliamentary elections scheduled later this week), there is another development, less visible from the country-wide maps of the election results. 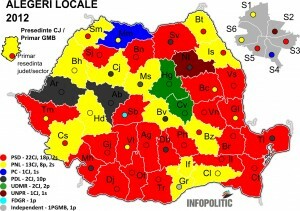 at a simple look over the various maps displaying the election results (see for instance the one provided by Infopolitic.ro, aici ; Adevarul, aici; and even Evenimentul Zilei, aici). In the electoral competition between the USL, on the one side, and the PDL on the other, a third political force has made its presence noted on the Romanian political scene. More clearly, the third largest party is the newly founded People’s Party–Dan Diaconescu (PP-DD/ Partidul Poporului Dan Diaconescu) (the party’s website, mainly in Romanian, aici). The PP-DD polled 9.23% for the presidents of the county councils; 7.29% for mayors; 8.96% for members of county councils. Concomitantly, the consecrated radical right populist (RRP) parties in Romania, namely the Greater Romania Party (PRM/ Partidul România Mare) and the New Generation Party (PNG/ Partidul Noua Generaţie) seem to have had only a marginal presence in the preferences of the Romanian electorate (the PRM polled somewhere around an average of 2%, while the PNG only 0.20%), and might actually signal that popular dissatisfaction is most successfully channeled by the PP-DD. previous governments found to have mismanaged the country; confiscation of illicit fortunes gained from pillaging the public goods, but also some surprising decidedly right wing, such as tax cuts, tax unification. All these are tinged with discrete nationalist appeals (the numerous and insistent references to supporting Romanianism, respecting the Romanian national anthem, subscription to Romanian Orthodox Christianity, etc.). In a sense, it reminds a lot of the PRM‘s main tenets at the beginning of 2000s as they were expressed by the party leader Corneliu Vadim Tudor. Even more so, as Romanian sociologist Mircea Kivu aptly noted in his analysis of the Romanian local elections and the emergence of new political entities contesting the elections (in Romania Libera, in Romanian, aici), the PP-DD candidates did not engage in any classical campaigning, opting for having their candidacy endorsed ‘on air’ at the TV station owned by Dan Diaconescu. This comes so strengthen my categorization of the PP-DD as an emerging radical right populist party, with a strong (male) leader that gives his formal ‘blessing’ to his acolytes on TV. In this light, if Corneliu Vadim Tudor had a very influential weekly magazine at his disposal to maneuver his captive electorate, Dan Diaconescu has taken the process to a new level, having his own TV station. Looking at how the local electoral competition has tested the newly founded parties within the Hungarian-speaking community, it becomes apparent that the Democratic Union of Hungarians in Romania (UDMR/Uniunea Democrată Maghiară din România, RMDSZ/Romániai Magyar Demokrata Szövetség) has managed to fend off the negative effects of its being in government the past decade, and used the nationalist escalations sponsored by the Hungarian government to appeal for a return to rationality and moderation. As such, the UDMR/RMDSZ registered some loses, but succeeded to collect 4.95% for the presidents of the county councils; 3.90% for mayors; 5.52% for members of county councils. In this context, the questions that arise pertain to the stability of the present political system in Romania, especially having in mind the wider developments across Europe. Is the USL alliance aware of the very delicate situation it is facing, with an interim government, already marred by serious scandals – it suffices to point at the no less than 3 ministers that succeeded in the Education portfolio in less than a month- , and the PDL apparently surprised by its own defeat? Does the PP-DD have the electoral appeal to play a similar function as the PRM in the 2000 Parliamentary elections, when it became the largest opposition party? Is the PP-DD the emerging radical right populist force in Romania? What would be the consequences of such a development, with the UDMR/RMDSZ apparently excluded from future government coalitions, and an ever more polarizing and nationalist Hungarian government? Are we witnessing yet another backlash against women in Romanian politics – only one woman has been elected mayor in one of the major cities in Romania, namely Lia Olguţa Vasilescu (PSD) in Craiova? 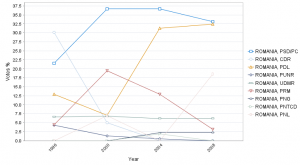 The 2009 European Parliamentary Elections: The Populist Dilemma? The coming EU elections have very interesting effects on the radical right populists across the Union. From the corner that interests me the most I can definitely say that these elections would be some very interesting events. For instance in Finland, the leader of the populist True Finns (PS/ Perussuomalaiset/ Sannfinländarna), Timo Soini suddenly decided to take upon himself the task of getting the party into the European Parliament (EP). However odd this may sound, but he declared he had changed his mind, in the sense that he turned from a staunchly anti-EU party leader of previous EU elections into the main candidate of the PS alliance with the Finnish Christian Democrats (KD/ Kristillisdemokraatit/ Kristdemokraterna). This came to calm down suspicions that the two parties will support the candidacy of a controversial independent politician that was elected into the capital’s city council with the support of PS. He was later on accused of racism and discriminatory remarks. So now party leader Soini has to convince his faithful that his party has any clear agenda once sent to Brussels. But what he is allegedly convinced of is that he would manage to bring to life an EU alliance of like-minded parties. One may actually start wondering how successful would he be, having in mind that the last such enterprise, the now defunct Identity, Tradition, Sovereignty (ITS) EP political alliance, did not manage to live more than a year, a result of the inherent clashed between parties with an agenda defined by their strong suspicion of the Other. How would Soini manage to convince all those populist EMPs and their national leaders that in fact they are not each other’s Evil Other, but in fact more than circumstantial allies? Le Pen was recently bared from symbolically opening the coming EP session, so an educated guess is that any such suggestions may go well. But how persuasive can be a Finnish MP, future EMP, with no experience of the European dealings? Does the announced cooperation with the future to be trans-European EU-skeptical Libertas alliance (there is a lot of irony in being an anti-EU, and yet pan- European grouping, isn’t it?) hold any chances for successful political leverage at EU level? Or will he attempt to join the European People’s Party and European Democrats (EPP-ED), the biggest alliance of parties within the EP, based on his electoral alliance with the aforesaid KD? But how effective will this be, having in mind PS’s record as a party at least suspicious, if not outright against anything that may be even hinted at as not being Finnish? Soini has always appeared to tone down the sometimes radical affirmations of his subordinates, so this may play in his advantage, but how much can one do to improve PS’s reputation as an isolationist, and even racist party? Well, these are just a few of the question that come to mind once reading about Soini’s EU turn. Looking at Romanian politics, it is going to be a very unusual election period. The Greater Romania Party (PRM/ Partidul Romania Mare) has decided, or more rightfully said, its leader Corneliu Vadim Tudor decided that the party’s EU election list will be opened by him and another controversial political figure, George Becali. Becali was for a while leader of another populist party, the New Generation Party (PNG) but this seems to have become a thing of the past. As such, the two former rivals, Tudor and Becali appeared on the party’s electoral posters reading: “Two Christians and patriots will purge the country from crooks” (“Doi crestini si patrioti vor scapa tara de hoti!”). What the two apparently have in common is their dedication for the church. This is intended to heal the rift between the two after several years of public confrontations that ended up in personal remarks not at all elegant, to put it mildly. It is to be seen how well the two temperamental leaders will put aside their past conflicts and march towards a EMP position. So, what could such a churchly dedication of the two do in the EP is not as obvious as the party leaders may think. PRM has already a certain tradition of allying itself with the French populists led by Le Pen (they were actually instrumental in the constitution of the aforesaid Identity, Tradition, Sovereignty (ITS) political group). But they are also those responsible, at least partly of its demise. To complicate matters further, PRM did not manage to convince Romanian voters of its ability to represent them at European level last time. It is to be seen if two religious figures, or at least declaratory religious, would manage to get the party the desired seats in the EP. On a closer look, it is not very clear what PRM has to offer this time around either. Romania has recently been criticized by the ineffectiveness of the judicial system and there are rumors that the country may have a similar fate as neighboring Bulgaria and see its EU funds frozen. How could the two populist leaders demise these dangers from their possible EMP seats? There is no easily distinguishable answer to these questions. The only sure thing is a discourse focused on, at least symbolically, punishing the corrupted elites. But here is a serious problem PRM faces, how to balance a discourse that promises impartial and harsh justice with a presence in the EP that is the epitome of compromise and long negotiations. What is almost certain, however, is that if they manage to get in, they will not be alone as the anti- sentiments across EU are on the rise. And for that is enough to look at another neighbor, Hungary, and the recent backlash against the Roma this country witnessed. Swinging back to the north of EU, what is happening in Sweden? Well, not much really. The main parties appear to be more preoccupied with rowing over internal politics, even when it comes to televised public debates about the future of EU. Having in mind that the country will be undertaking the presidency of the EU council the coming July this does not look too promising. But even Sweden may appear EU-friendly when compared witht the Czech performance so far. Returning to populists, the Sweden Democrats (SD/Sverigedemokraterna) do not fare much better than in previous opinion pools. SD has been ostracized to the peripheries of Swedish politics from early on, so the party still struggles to gain national representation; it is however quite strongly represented in the southern parts of Sweden. Even if they could have tried to ride the same populist, panic driven agenda as elsewhere, there is another forseable winner in the confrontation. SD was hoovering around the parliamentary threshold for a while but it is unlikely it will surpass the popularity of the Pirate Party (Piratpartiet). Theirs is a different type of populism, concerned, mainly, with the issues of copyright and patents and privacy writ large. And if it is to take into account the party membership numbers (which exceed to date those of the second largest governing party, the Center Party/ C/ Centerpartiet), and their strong support among the young voters, the Pirate Party seems to be on its way to register its first electoral success. But then again, labeling the Pirate Party as populist does not do much justice for its cause. It is more a single cause party, and it is to be seen, if it will enlarge its political agenda with other issues as well. Of crucial importance, in case of a victory is if the party will manage to survive its own political success and how much of the initial agenda will be preserved in the daily compromise politics at EP level. Three countries, three different populist trajectories. All competing for votes for a suddenly much wanted EMP position. Here rests the populist dilema, how much of the anti- attitude can a party preserve once joining the place where everything is ground to small, almost imperceptible nuances of language in official communiques? 2008: the final year of radical right populism in Romania? As a result of the November 30 parliamentary elections in Romania, the two major radical right populist parties have disappeared from the main political stage. The newly introduced electoral system, that of mixed member proportional representation (MMP), produced some interesting results. As such, the Greater Romania Party (PRM) that since 1991 has represented the radical right pole in Romanian politics, failed to attain the 4% threshold for any of the chambers of the Romanian Parliament. With less than half a million votes, PRM managed to poll 3.15% for the lower Chamber of Deputies, and 3.57% for the Senate. This practically interrupted Vadim Tudor’s, PRM‘s unquestioned leader, presence in the Romanian legislative fora. The other populist contender, the New Generation Party (PNG-CD), had an even poorer performance. With only 2.27% of the votes for the Chamber of Deputies, and 2.53% for the Senate, the party was confined to a presence at local level ( where it received some 1203 seats in the local councils, of 37,915 nation-wide). 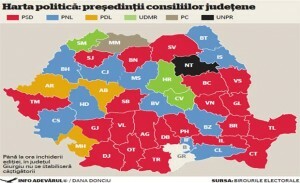 As a consequence of these results, the party announced that it entered a period of “preservation” (link in Romanian). George Becali, the colorful leader of PNG, failed to become a Romanian version of Silvio Berlusconi. Even though he is the main shareholder of the Steaua football club, a name in Romanian football, he did not manage to use this successfully in politics. But does this mean that radical right populism is a thing of the past in Romanian politics? Or is this just a sign that radical attitudes have permeated the political mainstream? Populism has been long assigned to political center stage in Eastern Europe, and Romania is no exception. However, the presence of the Democratic Union of Hungarians in Romania (UDMR/RMDSZ) in the governing coalitions in the 1996/2000, 2000/2004, and 2004/2008 mandates, ensured that the radical right with its xenophobic manifestations was only peripheral. But the new grand coalition, that gathers together the Romanian Social Democrats (PSD) and the Liberal Democrats (PLD) could not accommodate the presence of UDMR/RMDSZ in the governing architecture. Surprisingly enough, it was PSD the party that officially requested their expulsion from the partition of ministerial portfolios. Romanian political analysts have generally labeled this as the party’s “hunger for the public money”, and unwillingness “to divide the governmental cake”. But what if this is a disguised return to xenophobic populism? After all, PSD governed with PRM and other two xenophobic parties in the 1994/1996 mandate. 2009 is definitely going to be a very interesting year on the Romanian political scene.